At least the International Energy Agency has been saying: “U.S. 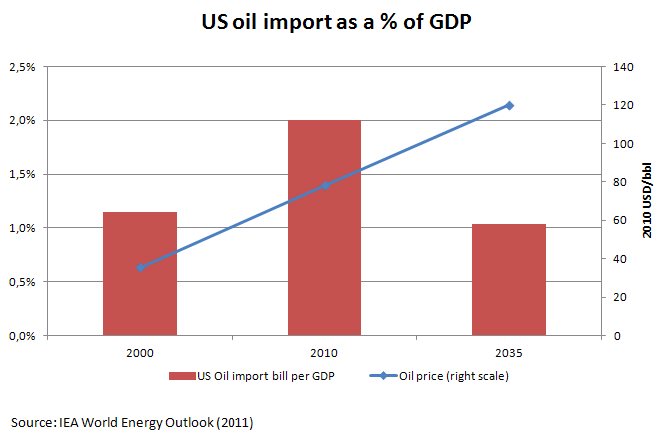 international oil security attention may not be as strong as today because U.S. will import much less oil than today”. Do we really have to start worrying then? The IEA expects the US to import much less oil, due to higher oil production and decreasing demand as car mileage standards become stricter. This phenomenon is really important, and merits interest in its own right. It means a new oil boom in the US, which not many had expected before (neither did the IEA, last year it projected US production to decline in the long run – http://www.worldenergyoutlook.org/publications/weo-2010/.) Its effects are also felt abroad: European refineries will have a harder time getting rid of the gasoline they cannot sell at home. But do we really need to fear that this will lead to the US abandoning its policy involvement to secure oil markets? I have serious doubts. Here is why. 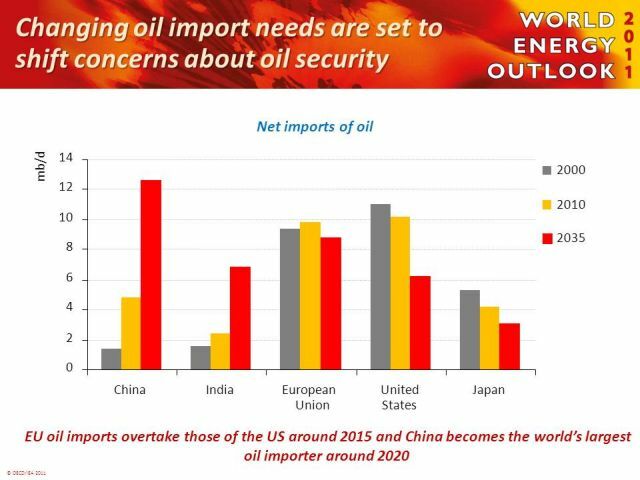 Second, the market of oil is a global, meaning that even if US imports decline, that still does not mean that it is detached from oil security risks elsewhere. If something suddenly happens to Iranian or Saudi supply, that instantaneously brings up the price of oil, to as much as 200 USD/bbl and send gasoline pump prices in the US through the roof. There are many analyses around how close the gasoline price in the US correlates with consumer confidence (which in turn affects voting behavior). Even though the IEA envisages a drop in imports, it does not project a major shift in the American gas-guzzling way of life. The IEA WEO expects the total US oil bill to grow almost threefold, from USD 246 bn in 2000 (2% of GDP) to USD 635 bn by 2035 (2.4% of GDP). Until much more dramatic changes happen, the US dependence on oil remains, and also the international policy interest with it.